An extension to my book 'Steam Trains and Jigsaw puzzles' published in 2007. 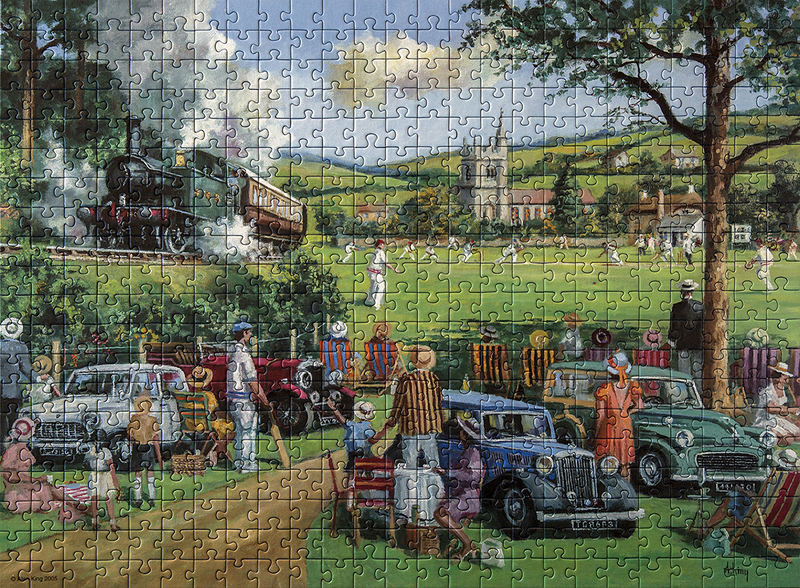 Today's jigsaw, 19 April 2019, is a 1000-piece Clementoni example cut into a large panoramic letterbox shape and titled Towards Dartmoor. In Peter Webster's artwork two small passenger trains are shown in a two-line country station, (South Devon?) hauled by an 0-6-0 pannier tank, in reverse, (right) and possibly, a small 2-6-2 Prairie tank (left). The pannier tank headed train is signalled to leave the station; the second train appears to be stationary. A half cab, single-deck bus is pictured in the forecourt, with two cars of similar vintage. Several passengers are distributed throughout the composition. It is a large, imposing jigsaw puzzle which attracted many admiring glances whilst on show on my dining room table, for a couple of days, following completion. Clementoni is an Italian company: input Clementoni into the search bar to see other steam train jigsaws from this company. 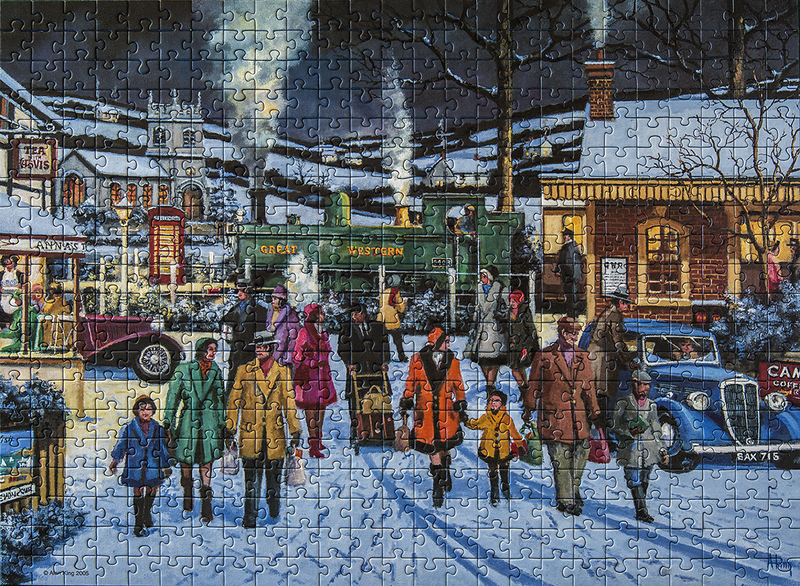 Today, 21 March 2019, I am describing a W.H.Smith jigsaw puzzle comprising the obligatory train among several winter village cameos. 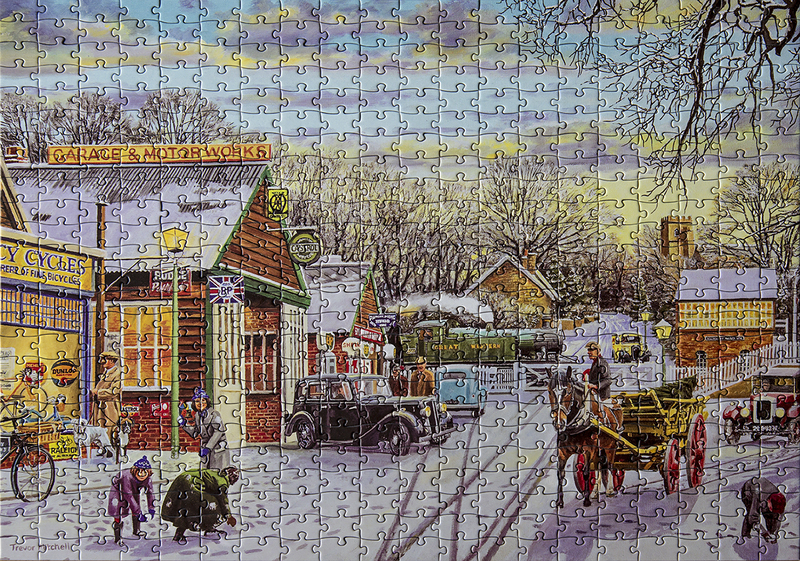 The jigsaw, titled Snow Day, is of 500 pieces and features the illustrative artwork of Trevor Mitchell. A Great Western Railway (GWR) prairie tank locomotive is shown passing over a level crossing. The date is possibly the mid 1940's as the GWR became the Western Region of British Railways from 1948.There are lots of cameos in Trevor's composition including a mum having a snowball fight with her children, a man with a horse and cart, the latter being used to carry a large Christmas tree, and four old cars. A garage and cycle shop add to the busy scene, with a signal box and a church in the background. Several people and two dogs add human and pet interest to the picture and a light covering of snow adds that special ingredient to the mix. A Ravensberger Pair- Railway Memories. Today's post, 13th February 2019, features two Ravensburger puzzles marketed as a pair, in a single box. The title for the pair, is Railway Memories. The first puzzle (left), is titled Titfield Thunderbolt. In Alan Kings painting an idyllic country village is depicted including crowds socialising at a cricket match, with picnics to the fore. Many families and 1950’s cars are included in the composition. A local train is passing close by, headed by a GWR 0-4-2 push and pull tank engine, No.1401, the same one that featured in the film Titfield Thunderbolt in 1953. The train draws attention from many villagers, especially from children. The four cars in Alan’s picture are a Morris Minor 1000 Traveller, a red 4-litre Bentley, a blue 1935 Triumph Vitesse and a Morris Minor Mini. 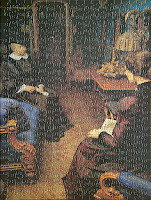 The second jigsaw (right),is titled Winter Service. Many passengers are pictured leaving a country station on a cold winter day carrying shopping bags and parcels. Two of the cars depicted in the first jigsaw of the duo, Titfield Thunderbolt, are also pictured in the forecourt of the station in Winter Service – the red 4-litre Bentley and the blue 1935 Triumph Vitesse. A GWR pannier tank 0-6-0 locomotive No.5043 is also prominent in the station and a forecourt tea shop adds further interest. Other human interest includes the stationmaster and engine driver having a ‘chinwag’ - Alan King is again, the artist. He included himself in the picture, identified as the young trainspotter in the beige coat and red scarf . Todays post, 31 January 2018, features a 500-piece jigsaw from Ravensburger that was made for the USA market. 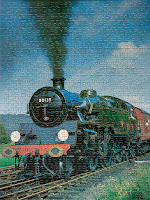 It is quite a unique steam railway puzzle of 'Large Piece Format', measuring 70cm x 50cm when completed. There is a lot of detail in the painting by British artist Michael Herring. Centre stage is a small L.N.E.R. tank engine, heading two small passenger coaches on a single track, rural line. Seven geese have escaped through a gap in the lineside fence, and have wandered on to the track in front of the stationary train. The geese are causing consternation among train crew and fascination among a few, visible passengers leaning from open carriage windows. The fireman and guard are shown walking beside the train towards the geese as the driver looks on from his cab. A man and his dog are approaching the line from a lineside property, presumably to rescue the geese. A shed is open alongside the property to re-house the geese. A covering of snow adds aesthetic appeal to the pictorial composition. The jigsaw is titled Snow Bound but the original artwork on Michael's website is titled Geese on the Line. The jigsaw is not generally available in the UK to the best of my knowledge, although my used USA copy, was purchased from a UK Amazon supplier. As it was first marketed in c2008, used copies may be the only examples currently available. Michael's picture must represent a British Railways' scene (1948-1968), as the logo - on the class 'J69', 0-6-0 tank engine, No.68579, designed by J. Holden, c1902 - was used post 1956. The locomotive was withdrawn from service in 1960. May I take this opportunity to wish all supporters of the blog a happy, healthy and prosperous New Year. Today's post, 5th January 2019, features two pics of portrait style jigsaws from Sovereign Publications. Titled M.R. 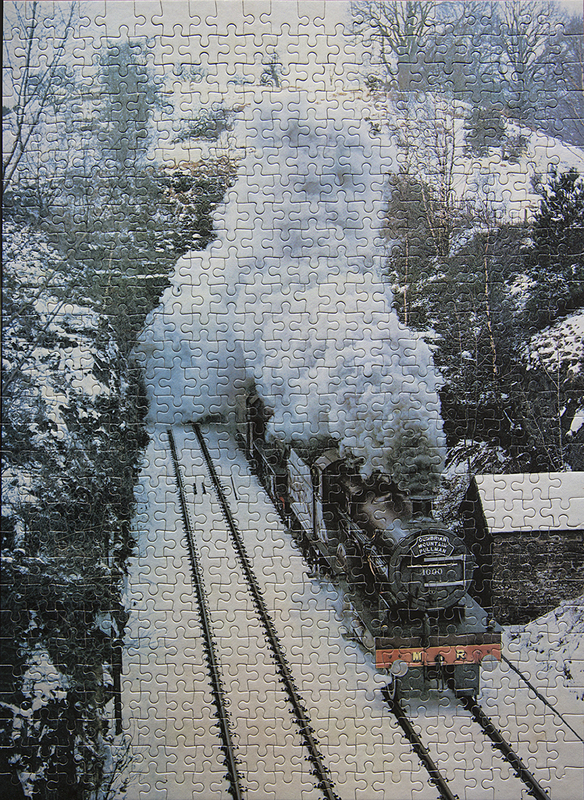 Compound Class 4 4-4-0 No.1000, (left), this 600-piece jigsaw from Sovereign Publications shows the preserved compound, Midland Railway (MR) locomotive on the 'Cumbrian Mountain Pullman' 'Special'. No.1000 was the first locomotive designed by Samuel Johnson for the MR. She was built at Derby Works in 1902 as No.2631, but renumbered to No.1000 in 1907. Richard Deeley modified the design in 1914 in which state she remained until 1923, when she became part of the London Midland & Scottish Railway (LMS). Nationalisation in 1948 meant renumbering again as British Railways (BR) No.41000. She was 'pensioned off' from BR in 1951, heading for preservation. Restored in 1959 to virtually 1914 condition and MR red livery, to run main line 'Specials', she was then stored at the Transport Museum in Clapham. She became a static exhibit at the National Railway Museum in York but is now at the Barrow Hill Engine shed in Derbyshire, on loan. 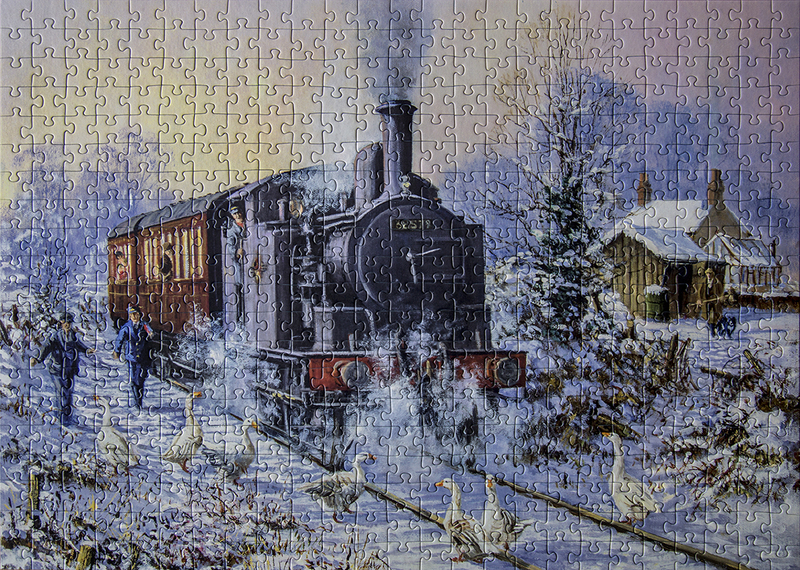 In the jigsaw photograph the locomotive is double-heading with a second engine but there are no details on the box. However, David Rostance' photographs on 'Flickr' show No.1000 double heading with 'Jubilee' class 4-6-0, No.5690 Leander, heading the 'Cumbrian Mountain Pullman' on 5th and 12th February 1983. These photographs in the snow show many similarities to the jigsaw picture. A postcard of the same photograph used for the jigsaw has been on sale on Ebay recently. The jigsaw (right) is titled B.R. Class 4MT No.80135. The locomotive was built as a large, 2-6-4 tank type by Robert Riddles, of British Railways, in 1956 at Brighton. She was withdrawn from service in 1965 and arrived at Barry Scrapyard a year later. In 1973, the locomotive became the 39th condemned example to be reprieved and rescued from the famous Woodham Bro's scrapyard. She was to be purchased by the North Yorkshire Moors Railway Trust (NYMRT) in 1973, but shortage of cash meant that she was sold to a Dutch businessman, who had her restored between 1977-1980. On his death in 2006, the locomotive was bequeathed to the NYMR where she remains today. She is out of service for repairs at the present time. In this post, 7 December 2018, I am describing the second pair of puzzles mentioned in the previous post - i.e. 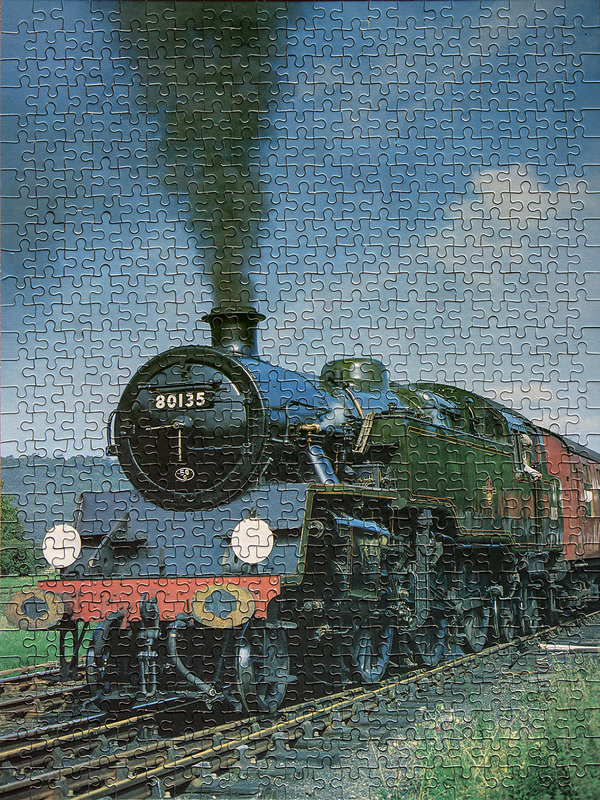 the final two from a set of four jigsaws showing Classic British Trains, marketed by Chums. 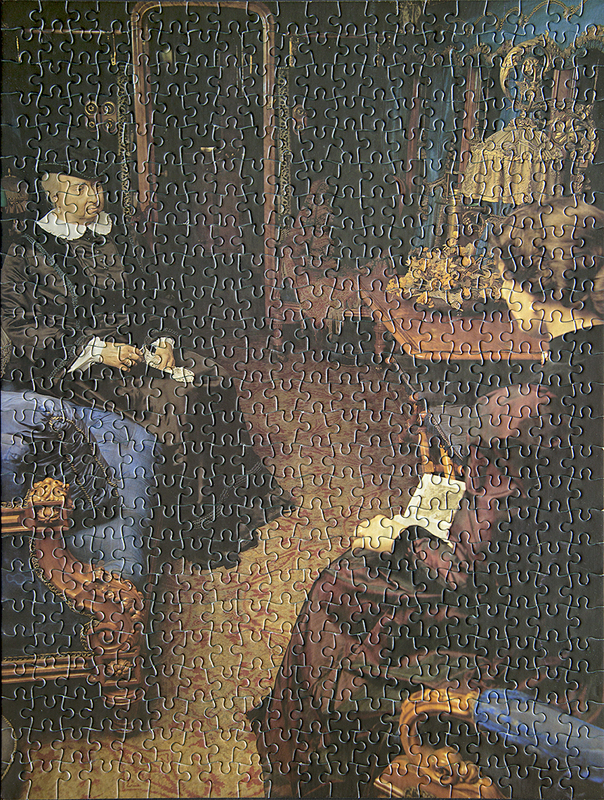 Both are of 500 pieces, made by Grovely JHG Puzzles. The first, left, is titled Flying Scotsman, Keighley & Worth Valley Railway. 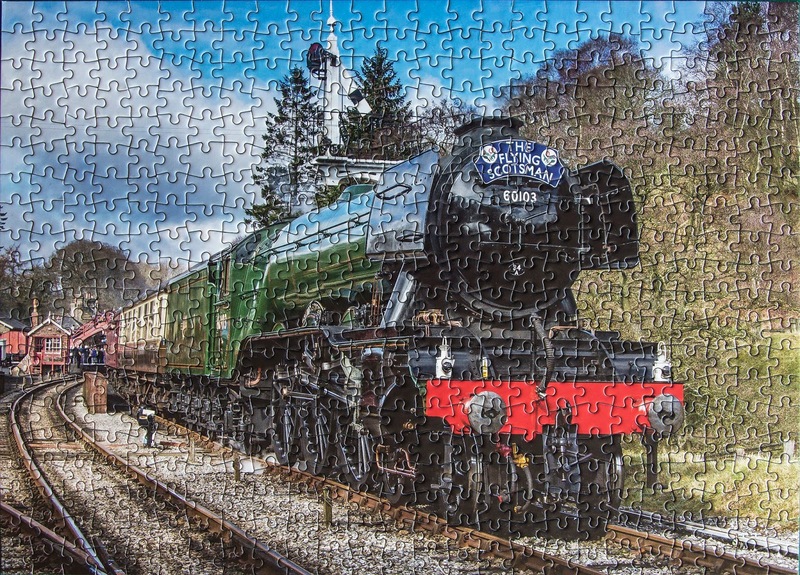 The puzzle picture shows the famous locomotive, ex LNER class 'A1/A3' 4-6-2 No.60103 Flying Scotsman, heading a passenger service across a road at Oakworth. Gathered steam enthusiasts are positioned to photograph the passing train and a single, signal gantry is prominent. The blog source of more information about Flying Scotsman, the locomotive and the named train, is described in the previous post. The second puzzle, right, is titled Jinty No. 47406, Idridgehay. Ex LMS class '3F' 0-6-0T tank locomotive, No.47406 was the 147th locomotive to leave the famous Barry Scrapyard (South Wales) in 1983. She was one of 422 built between 1924 and 1931 and was withdrawn from BR service in 1967; she has been based at the Grand Central Railway, at Loughborough, since 2010. The jigsaw photograph however, shows the loco on the Ecclesbourne Valley Railway, at Idridgehay. The railway runs from Wirksworth to Duffield in the Derbyshire Peak District, a distance of around 9 miles. A small extension of less than 1 mile joins Wirksworth to Raventor, close to the High Peak Trail and National Stone Centre. The jigsaw photograph was probably taken in 2017 when No.47406 was visiting the EVR. Today's post, 18 November 2018, features half of a quartet of super jigsaws retailed by Chums, but from the Grovely JHG Jigsaws stable. 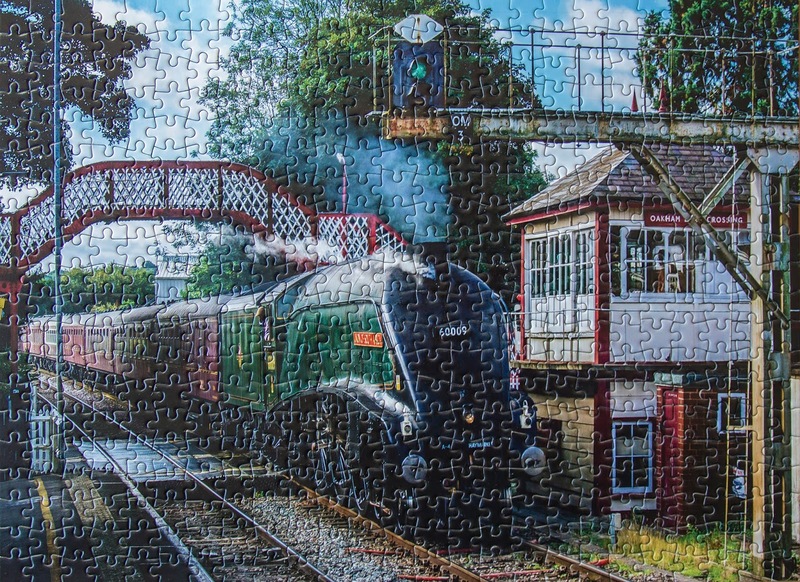 I tried to purchase a set of 4 steam railway jigsaws from Chums, close to Christmas last year, but was told that they had sold out and no more were expected. This year I went much earlier and bought the current set of 4 featuring Heritage Railway photographs of excellent quality (not always the case with photographs). The two published here are (left) Flying Scotsman, Goathland and (right) Union of South Africa, Oakham, locomotives at the forefront of main line steam. Information on Flying Scotsman, locomotive and train, can be found in the post of 28th June 2011; just click on the year in the side bar archive, and the posts will appear. Goathland is a station on the North Yorkshire Moors Railway. The village is famous as the set for the TV series Heartbeat. Union of South Africa was designed by Sir Nigel Gresley of the L.N.E.R. and appeared in 1937 as No.4488 Osprey. She was re-named a little later to commemorate the founding of the Union of South Africa. Unfortunately for steam enthusiasts and class 'A4' lovers in particular, owner John Cameron is insistent that the locomotive will be retired in April 2019, along with his 'K4' class 2-6-0 locomotive, The Great Marquess. He intends to build a special visitor centre for both on his farm in Scotland. Oakham is a station in Rutland. The centre of attraction in today's post, 23rd October 2018, is the new-ish, 4-6-2 steam locomotive No.60163 Tornado. I say this because she is the most recent steam locomotive to be built in the UK, (at Darlington Works in 2008), and the first one since Evening Star graced BR metals (rails) in 1960. Tornado has been a regular attraction on the Main Line and at Heritage Railway events since her introduction in 2008. She is the only LNER, Peppercorn 'A1' class locomotive in existence, as the other members of the class were all scrapped in the British Railways' era. Tornado is also the only steam locomotive to reach 100mph for over 50 years, the first being Flying Scotsman or City of Truro - depending on whether you are an LNER or a GWR enthusiast. 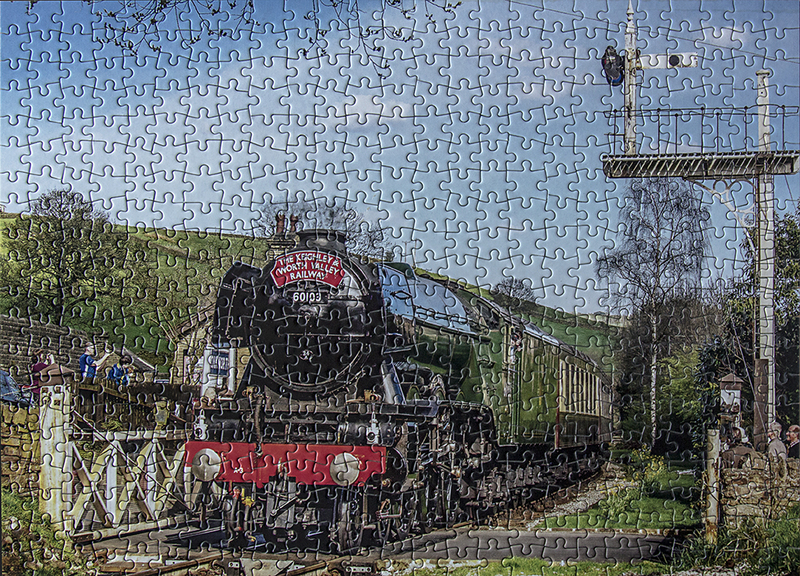 She was built for the A1 Locomotive Trust and photographs of the engine have been arranged as a montage in the jigsaw above. 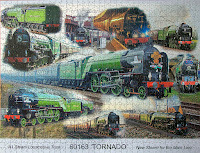 The 1000-piece jigsaw, simply titled 60163 'TORNADO', was produced by Ryco Crafts of Ripon. In this post, 20 September 2018, I am describing a jigsaw puzzle from Gibsons which is sold in a small gift box, rather than the standard, metallic blue boxes. 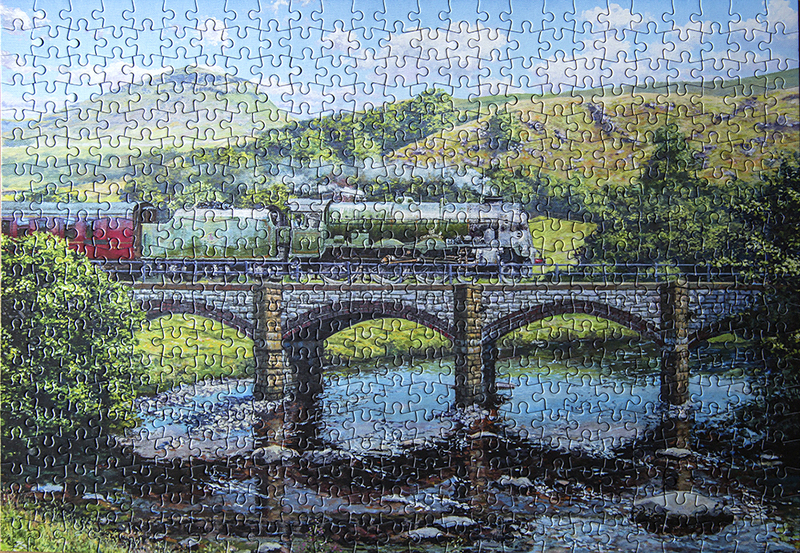 The jigsaw, titled Crossing the Ribble, is of 500 pieces and features the superb artwork of GRA (Guild of Railway Artists) member, Stephen Warnes. Helwith Bridge (spelled incorrectly on the box) is a popular location on the Settle to Carlisle railway line, frequented by photographers. The famous line is affectionately referred to as 'the long drag'. The 5-arch bridge spans the River Ribble in Upper Ribblesdale around 5 miles from the market town of Settle. In Stephen Warnes' painting, the Fowler/Stanier rebuilt 'Royal Scot' class, 4-6-0 locomotive No.46113 Cameronian, is pictured passing over Helwith Bridge, in the early 1960's. The mountain in the background, I think, is Pen-y gent (email me if I'm wrong). 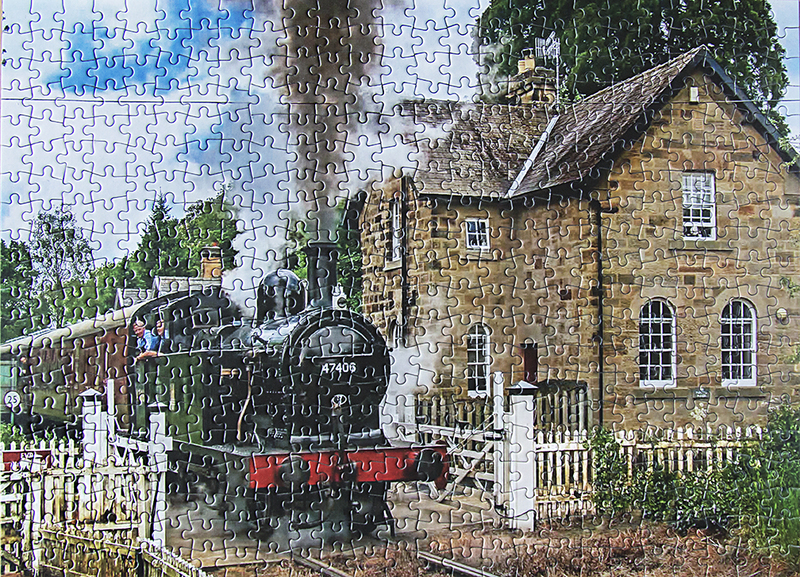 This post, 6th September 2018, features a jigsaw puzzle that fits perfectly into the blog title even though it is single railway carriage with no steam engine in sight; but what a carriage.... Titled Queen Victoria's Royal Saloon, the jigsaw is a 500-piece example produced for the National Railway Museum, York, by Country House Treasures. Towards the end of the 19th Century, the UK steam railway network had grown at a rapid rate, and most of the major Railway Companies in the UK had built elaborately decorated carriages for use by the Royal Family. Queen Victoria's London and North Western Railway Saloon was originally built in 1869 as a special pair of coaches, one each for day and night. The cost was £1,800 and Victoria paid £800 of her own money towards the cost. In 1895 the two carriages were rebuilt and merged into a single unit. The jigsaw photograph shows a view of the main interior lounge; all of the colour schemes were chosen by the Queen herself . The L&NWR Saloon was a personal favourite of the Queen and in 1897, was used for her Diamond Jubilee Celebrations. The Saloon became a major exhibit in the National Railway Museum, in 1975. A replica was installed into an exhibition at Ballater Station on Royal Deeside, near Balmoral, in 2008. On the 'Wapedia-Wiki:British Royal Train' website, the purposely constructed Royal Train carriages are listed in chronological order through to our present Queen's Silver Jubilee year, 1977. The Ten Most Popular Posts Over The Last Thirty Days.